In my last purchase from beer-wine.com, I picked up a small, one gallon glass jug to try some experimental, boutique fermentation. The idea behind this was to just have some fun and try some recipes I would not normally want five gallons of. Some things I've wanted to try are fermenting pomegranate juice, carrot juice, etc. Pomegranate juice sounded the most promising, so I've decided to try that one first. Unfortunately, at $10 a bottle, it'll probably be one of my more expensive experiments. But since the POM brand is flash-pasteurized, I didn't have to use campden tablets to kill of any wild yeasts like you would for cider. 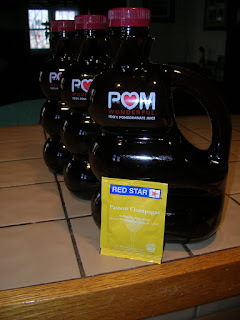 I used Red Star champagne yeast, add that to 3 bottles of POM juice, stirred it up in a sterilized jar, and just let it hang out near the radiator just to jump start the yeast. I'm not sure how long this will take, or exactly the end results. 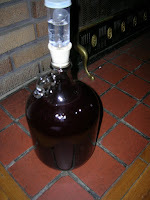 But we might let some ferment out to pomegranate cider, then put some aside to mellow out into pomegranate wine. The one thing I worry about is that the fermentation may initially sharpen the already high acidity of the pomegranate juice, so it may need a year or more of bottling to loose its edge. Another thing I'd like to try this with is small-batch beers. Some of the more unique ideas in my head are a fresh-mint pilsner, pecan-infused brown ale, or just trying out different types of smoked beers. I really enjoy smoked beers, especially the smoked porter by Stone Brewing Co. I had also tried a number of smoked beers that taste like ham. So I'd like to do some small batch recipes to avoid the ham-factor. I was also very pleased with the results of my rooibos pilsner, so I'd like to experiment a bit more with teas. I'd like to try some black teas, but their flavors really degrade in a short period of time, so it might not work out for 5-10 days of fermenting. But I think it might be worth a shot. Or perhaps a hibiscus kolsch in the summer. Lots of opportunities! Sounds like something I'd like to try! I'll make sure to save one for you!